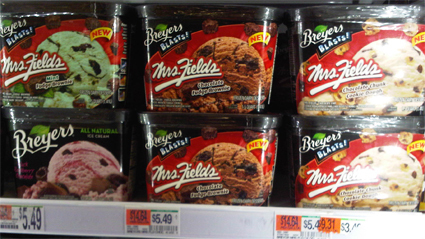 On Second Scoop: Ice Cream Reviews: Spring is in the air 2011, time for new products! Spring is in the air 2011, time for new products! YAY for March! I'm so excited that spring is almost here for two reasons. The first, I can actually see part of my lawn again after two months and about 4 feet of snow, YAY for grass! Granted, now I can see that all the bushes have been crushed and I'll have to start over, but let's not dwell on that. The second reason I'm excited? New ice cream!! YAY! It's time for the shaky cam debut of some of the 2011 new product lineup from our friends at lots of various ice cream companies. 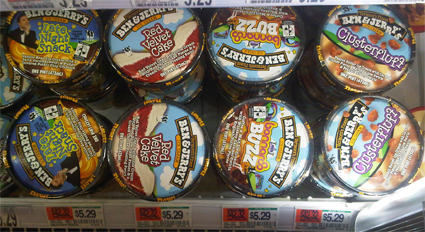 Well, we already knew which new Ben & Jerry's flavors were hitting us first, but it's nice to actually see them in my local freezer section. We've got Late Night Snack, Red Velvet Cake, bonaroo BUZZ, and Clusterfluff. I've also heard from a few people that Walmart alone is carrying limited edition blueberry cheesecake. I mentioned that Breyers has converted the OVERLOAD! line up to the BLASTS! lineup. We've now got WAFFLE CONE with Hershey's coating, Chips Ahoy! which is a vanilla base with fudge swirl and chips ahoy cookies and OREO which is a chocolate base with Oreo cookies. We've also got Mrs. Fields Mint Fudge Brownies, Mrs. Fields Chocolate Fudge Brownies, and Mrs. Fields Chocolate Chunk Cookie Dough. Wait, what? competing BLASTS! flavors? That's weird. I'll have to do some investigating on this one. 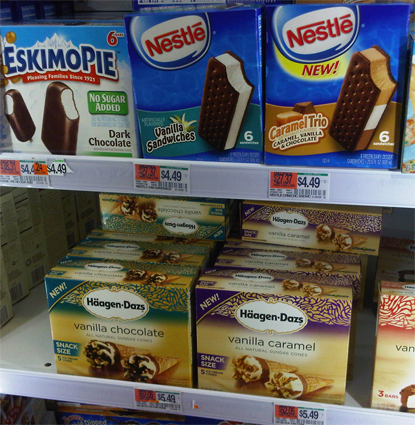 Now the new Nestle Caramel Trio ice cream sandwiches probably caught you eye at first glance, but look down below! Haagen-Dazs, which is owned by Nestle, now has their own snack sized, ALL NATURAL, sundae cones! I'd hazard a guess that they are the same size as Lil' Drums (mini drumsticks). I do love cones, so you know I will be trying these sooner rather than later. Can I throw a quick ding out at Nestle for the name "caramel trio". Just like the "three tenors" are, you know, 3 tenors, caramel trio should mean 3 caramel flavors, or they should call it something else. Now I don't know if this is new-new, but it says limited edition and I've never noticed them before. 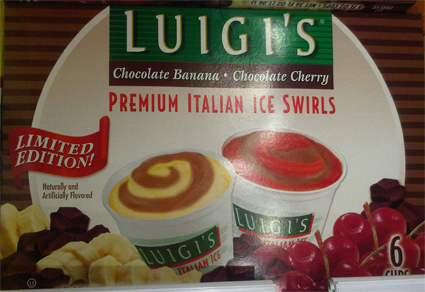 It's Luigi's chocoalte banana and chocolate cherry 6 pack. Now I won't be buying these things, especially since I prefer Lindy's, but maybe somebody out there will be excited. 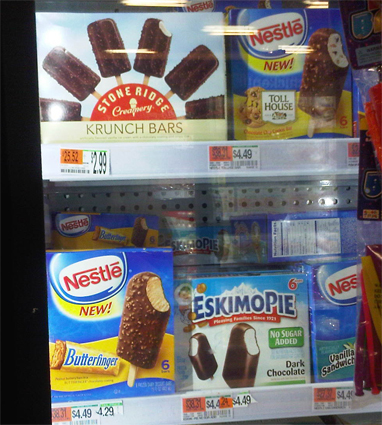 Ok, more new goodies from Nestle. Well, maybe I should say one of them is a retooled idea from Nestle. I've had a butterfinger bar before, but now they come in this very tempting 6 pack. More unique is the new toll house chocolate chip cookie bar! Don't think I've ever seen anything like that and a quick google search confirms my hypothesis. I'll definitely pick up a box when I head back to the store. 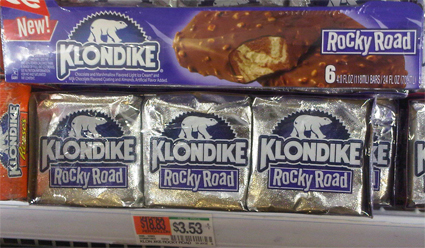 I got a big kick from Klondike when I saw there brand new Rocky Road Klondike Bars! I do love Rocky Road, so I will be trying these soon enough. It's chocolate and marshmallow light ice cream with a milk chocolate almond coating. Mmmmmm, Rocky Road! I actually spied these a few weeks ago. Friendly's has jumped into the single server market which I think is a great idea to snag a few hits from the lunch time crowd. 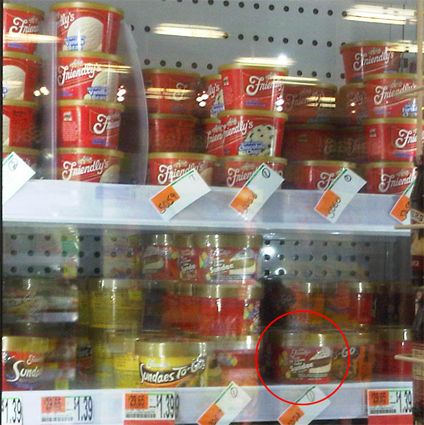 I also want to point out (red circle) their new ice cream cake Sundae cup. Friendly's makes a a good standard ice cream cake so this should be a fun little sundae to try. Ok, that's it for now. If you spy anything else new, let me know. I do know that Blue Bell is introducing half gallons of Chocolate Mud Pie (creamy chocolate ice cream loaded with mixed-nut shortbread, a smooth milk chocolate sauce and a whipped topping swirl) and pints of Krazy Kookie Dough ( Cake Batter Ice Cream with sugar cookie dough pieces in bright shades of green, blue and pink). Hmmm, if only I could get my hands on some! Perry's has Very Cherry, Banana Cream Pie and Light Piece of Cake coming to stores, though I'd much rather try their ice cream stand only Sprinkle Cone flavor so I could discover what Sugar cone ice cream tastes like. Update: I just saw two new triple flavors from Edy's. I saw Triple Cookie Fudge Sundae and Triple Chocolate Peanut Butter Sundae. I will pick one up when I head back to the store since I'm intrigued by the whole side by side by side flavor layout. What grocery store did you find the new Ben & Jerry's flavors at, I live in Florida, and I've tried Walmart, Publix, and Winn-Dixie. BTW, I have been trying to try every Ben & Jerry's flavor ever made (excluding the discontinued flavors that I will never get to try, :(. ) and on a recent shopping trip to Walmart I found and bought a new limited batch flavor, Blueberry Cheesecake, just so you know it's out there, so you can try it to. :) Thanks. is that store charging $5.29 for B&J? I would probably only throw down that type of cash on late night. Most of my shopping is at Market Basket which has better prices and good selection, but there new product selection can lag a little here and there. I buy my B&J's there if I can, it's only like $2.69. Thanks for the blueberry cheesecake tip, I'll definitely get it up on the site in the near future. Oh wow!! You get new spring easter flavours, i officially annouce the UK has boring for ice cream! We barely have anything like this :( im extremely jealous haha! Utah I understand, but Maryland? and my condolences to our mates across the pond! are there any alternatives? am i the only one who thinks that the worst part of the crises in the mideast is that rising oil and gas prices will likely lead to higher ice cream prices? Spotted a few other "new" products on shleves today Dubba. WW single serving cups of "Peanut Butter Dream" and a new Cookie and Cream novelty from Skinny Cow. none of the new ben & jerry's flavors are found anywhere near where i live. i haven't been this sad since MASH was cancelled. if there was ever a reason to write my congressional district representative to fix something, i think this is it.